Facebook has been ordered to pay £3,000 damages to a loyalist flag protester for online comments about his children's religion. High Court judge Mr Justice Colton, sitting in Belfast, found the social media company liable for misuse of private information. The man - known as J20 - sued Facebook over a series of offensive comments posted on its pages. J20 came under the spotlight for his involvement in loyalist demonstrations. 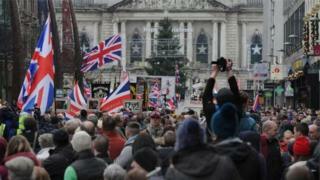 It followed a decision in December 2012 to limit the flying of the union flag at Belfast City Hall. The court heard that J20 had a conviction for disorderly behaviour over an incident linked to tensions at the time. In September 2013, one page included a picture of the man standing in front of the flag. It named him and the caption read: "Meet Sectarian Parade Organiser". A number of allegations and comments about the man were posted underneath the picture by various users. In his legal action against Facebook, the man sued for harassment and misuse of private information. Dismissing the harassment claim, Mr Justice Colton said the comments were offensive and distasteful, but did not "cross the boundary between what is unattractive and unreasonable as opposed to what is oppressive and unacceptable". The judge said J20 had understated his involvement in the flag protests. But he held that the man did have a right to privacy over the religion of his children. "The reference to these children - who can be identified by reason of the identification of the mother of the plaintiff's ex-partner - in my view does constitute a misuse of private information," he said. Ruling that Facebook was liable, he awarded £3,000 damages.